Cook with TexJoy - Worcestershire Seasoning as a marinade or even as a substitute for marinade. Made for steaks, but goes great on chicken, chops, barbeque brisket and a rack of ribs. 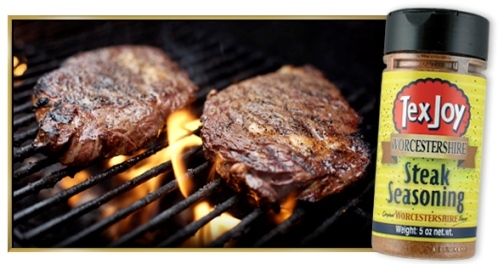 Simply rub the steak with TexJoy Steak Seasoning with Worcestershire prior to putting on the grill or pan. Rub liberally on at least one side, if not both. Also good for preparing burgers, pork chops and chicken. As much as folks like to cook their steaks with this blend, burgers are just as popular! This blend puts the best of both in one, easy-to--use jar and eliminates an extra step or two! Use TexJoy with Worcestershire in place of salt and pepper after the meal is cooked as well. Just shake on for fast foods, soups, rice and gravy or whatever you wish. Enjoy with TexJoy...and Worcestershire. Makes for a perfect gift for any griller as a unique spice that you can't get just anywhere!